Who doesn’t love a warm bowl of delicious chili? 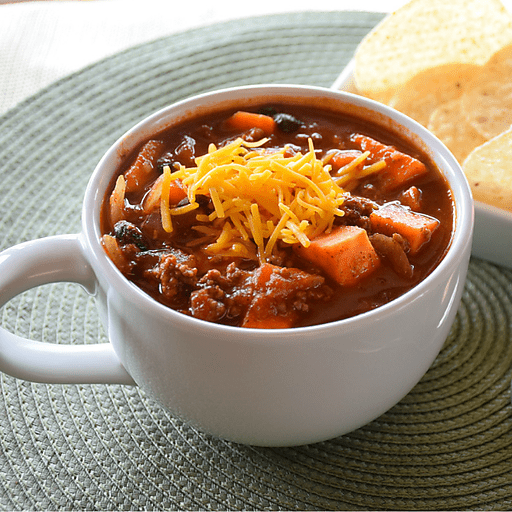 Perfect for tailgating, family gatherings, or an easy weeknight meal, chili is a great way to please just about anyone. Made with festive, fall-inspired flavors, like sweet potatoes and cinnamon, this zippy, and not overly spicy, chili is delicious garnished with a dollop of plain Greek yogurt, shredded cheese, crushed tortilla chips, or creamy, diced avocado. 1. In a large soup pot, brown ground turkey over medium heat. Add onion and sauté until translucent, about 5 minutes. 1. Place remaining 7 ingredients into pot and bring to a boil over high heat. Reduce heat to medium-low and let simmer for 15 minutes or until sweet potatoes are soft. Top with optional garnishes and serve warm. Homemade Chili Seasoning: In a small bowl, mix together 1 Tbsp. chili powder, 1 tsp. ground cumin, ¼ tsp. salt, ¼ tsp. black pepper, ⅛ tsp. cayenne pepper (optional), 1 tsp. garlic powder, and 1 tsp. onion powder. Per Serving: Calories 200, Total Fat 5g (Saturated 1.5g, Trans 0g), Cholesterol 40mg, Sodium 500mg, Total Carbohydrate 23g (Dietary Fiber 7g, Sugars 6g), Protein 16g, Vitamin A 140%, Vitamin C 20%, Calcium 8%, Iron 20% *Nutritional values are an approximation. Actual nutritional values may vary due to preparation techniques, variations related to suppliers, regional and seasonal differences, or rounding.